Nowadays travel is no longer seen as a frivolous hobby or a routine break from your otherwise hectic lifestyle. With aficionados of the same earning big bucks and advertising their experiences in fancy locales and exotic overseas destinations, travelling has now become akin to a spiritual retreat, with each and every aspect of the journey- mode of transport, place of stay, food and beverages, attire, itinerary- elevated to a pedestal of poised refinement that stimulates rejuvenation and promotes a completely life-changing vibe. Your accommodations during your travels is an integral aspect to be considered. After all, it is your home away from home, your sanctum sanctorum. Hoteliers and restaurateurs are, thus, stepping up their game to ensure that your stay within the premises of the hotel is relaxing and holistic. 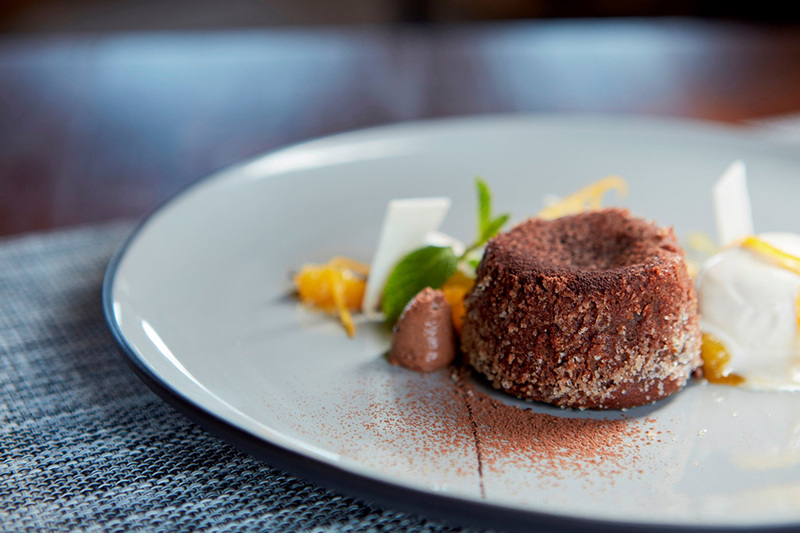 From spa and retail therapy to a thriving nightlife, provisions for almost everything are now available on site, tempting you to stay in for as long as you can. The Wild Coast Tented Lodge has been established adjacent to the park premises so that visitors and guests are able to experience the thrill of the jungle from the closest quarters. Wildlife buffs, adventure seekers, or those looking for a much-needed change from the mundane shades of grey in the city can enjoy their stay at the Lodge. 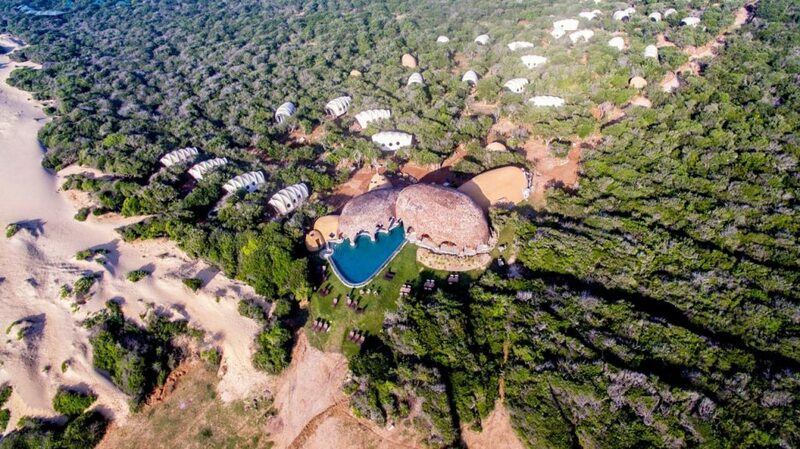 The premises were set up strategically at the junction of the jungle and the wild beach, overlooking the crystal blue waters of the Indian Ocean, so that guests can avail the best of both worlds. The site of the Lodge consists of such myriad and diverse contradictions, all co-existing within the premises. 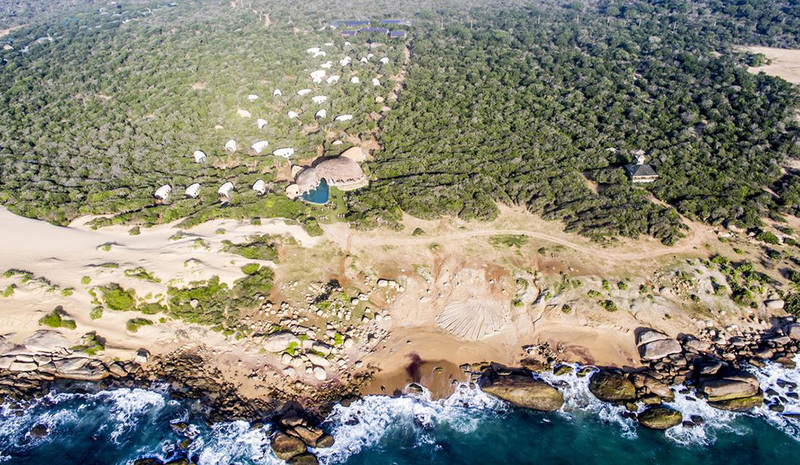 The jungle on one side and the beach on the other, the Wild Coast Tented Lodge in Yala is a luxury lodging facility, built as per a tented campsite structure. The idea behind such a unique format of luxury architecture can be traced back to none other than Nomadic Resorts, comprising only the most renowned English, Dutch, and Sri Lankan architects and interior designers. 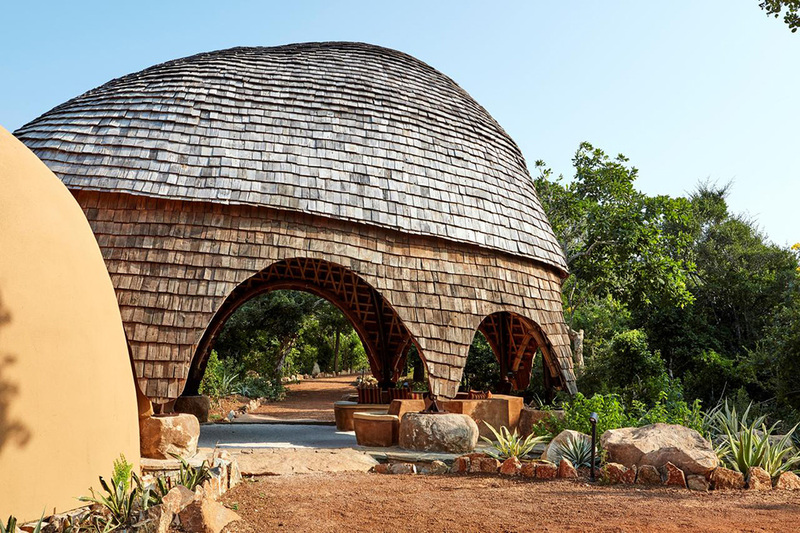 The fact that the lodge premises were built with carefully selected, naturally occurring materials to stay true to the sustainable, green and untouched locale surrounding the site, is one of many examples of the designers’ brilliance. 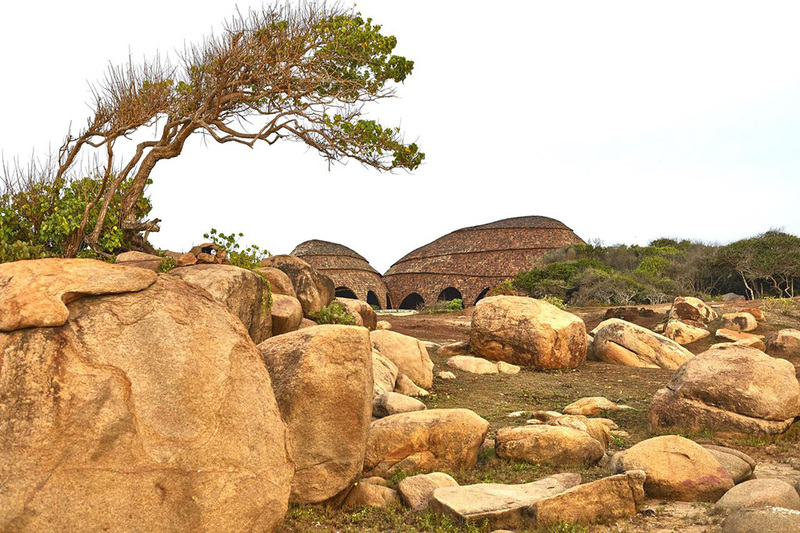 The tents have been built using arched fabric structures so as to highlight their ability to camouflage themselves amidst the similar boulders and rocks. The layout collectively forms the shape of a leopard’s paw print, a sort of tribute to the King Cat of Yala’s jungles. There are 28 tents in total, and each one of them is air-conditioned and fully-provisioned with 5-star amenities available to guests. These are called Cocoons and Urchins. 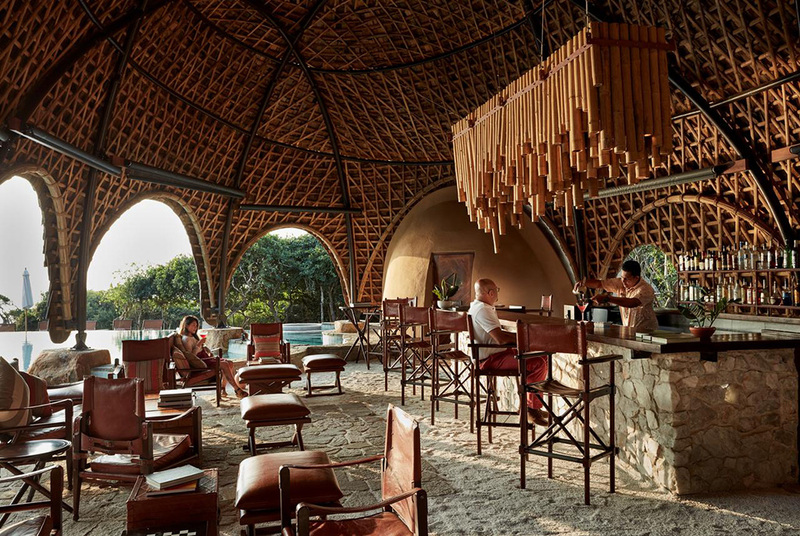 The main buildings have deliberately been built using bamboo so as to merge them with the background of the atypical rock formations of the jungle city. The Cocoon Suites are equipped with soaring ceilings so that guests can enjoy the best views of the jungle from the double-height structures. The interiors of the suites have been designed to fuse the rustic aesthetics of colonial exploration ventures and the contemporary urban pastoral. Copper bathtubs, hardwood teak floors,and four-poster beds combine beautifully with the traces of dark leather around the room and metallic hardware to give way to an eclectic jungle fever. 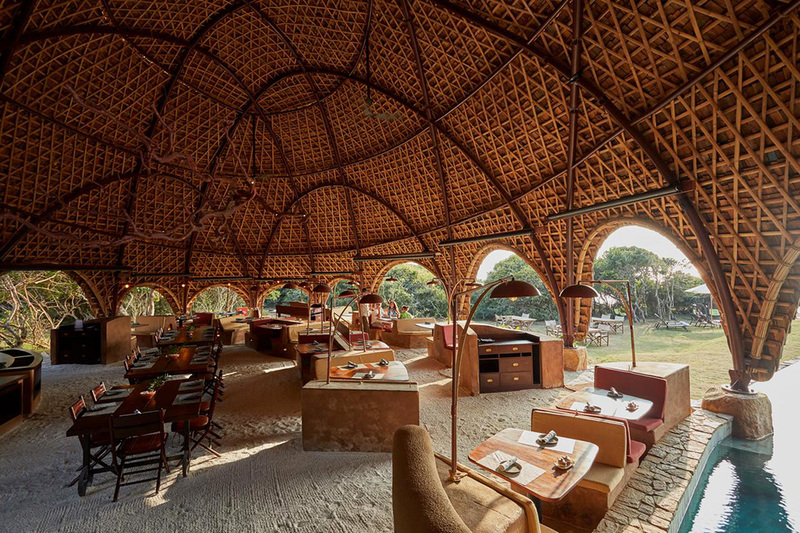 The Bar and Dining Pavilion, which is frequented by guests throughout the day, was also built using bamboo, primarily. The pavilion is open-air and bears an almost unmistakable resemblance with the sandy stretches of the beach. It envelopes itself around the lodge’s swimming pool. It doesn’t take long for the guests to understand that the resort premises, grand as they are, are actually an exercise in humility and giving back to Mother Nature in abundance what you took from her. The architecture is marvelous and innovative and yet, it doesn’t strain to distinguish itself; instead, it seamlessly blends in with the natural beauty that already exists all around it. Similarly, natural resources and materials have been used as much as possible in its construction so as to reduce the ultimate carbon footprint. The modus operandi of the resort is equally ethical in keeping with the vision- saline sea water is treated and delivered as drinking water to the water holes for animals, solar energy is the prime source of energy within the premises and organic waste is sorted out and composted. The establishment of a conservation center is also in the works to supervise and promote the growth of endangered wildlife, including the totemic leopard, in the park. You’ll never have to suffer through a boring moment at the Lodge. 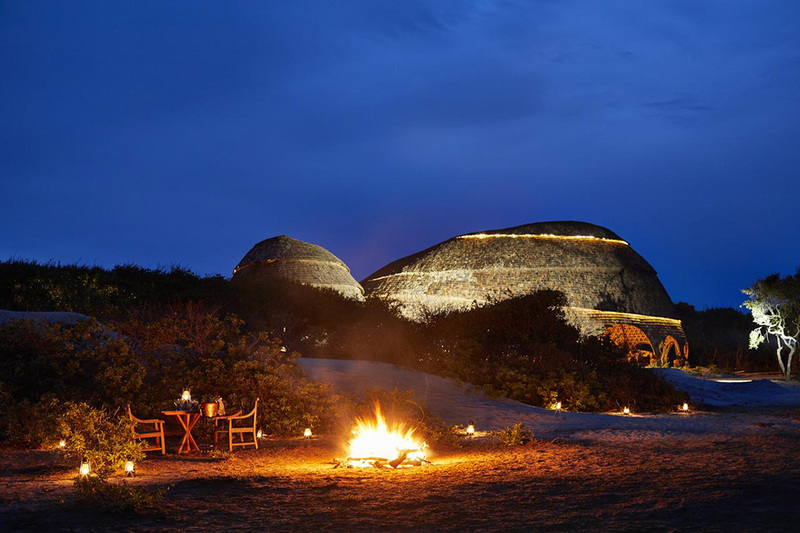 Of course, beyond the premises, Yala has no dearth of exciting activities and one-in-a-million sights to take in. However, even within the confines of the retreat, one can have a gala time. So, if on a particular day, you don’t really feel like going out on an adventure, and if relaxation is what you are seeking, there’s no reason to stay cooped up in your room either! For starters, the Wild Coast Tented Lodge offers its guests elaborate tours of the vicinity, namely the national park, accompanied by trained and courteous tour guides, who are well aware of the history and geography of its biodiversity. Comfortable vehicles with skilled drivers are available for such expeditions. If you’re lucky, you might just catch a glimpse of the nimble-footed leopard or even the mild-mannered elephant. Lectures and workshops are conducted on a regular basis to educate guests on the thriving fauna, including but not limited to the wild elephant behavior, bird watching and nature walks. The neighborhood is also dotted with a number of historic Buddhist and Hindu remains and the Lodge offers provisions for guided excursions. To mention a few neighboring tourist attractions that might be of interest to you, the Kataragama Temple and the Kirinda Temple are a round-the-year attraction for history buffs. The Ranminitenna Tele Cinema Village is located only 12.3 km from the hotel if you ever miss the humdrum of the city. A healing massage by the greenery of the beach, with the soft breezes from the sea relaxing your senses- this sort of a calming experience is something that you will only get to avail at the Sanctuary Spa at Wild Coast Tented Lodge. The tranquil ambiance, coupled with the Ceylon Tea and Ceylon Cinnamon, two of the most active ingredients in the spa’s oils, scrubs,and poultices, helps you indulge in a form of aromatherapy unique to Sri Lankan shores. But of course, no sensual experience is ever complete without the stimulation of the olfactory and gustatory receptors. 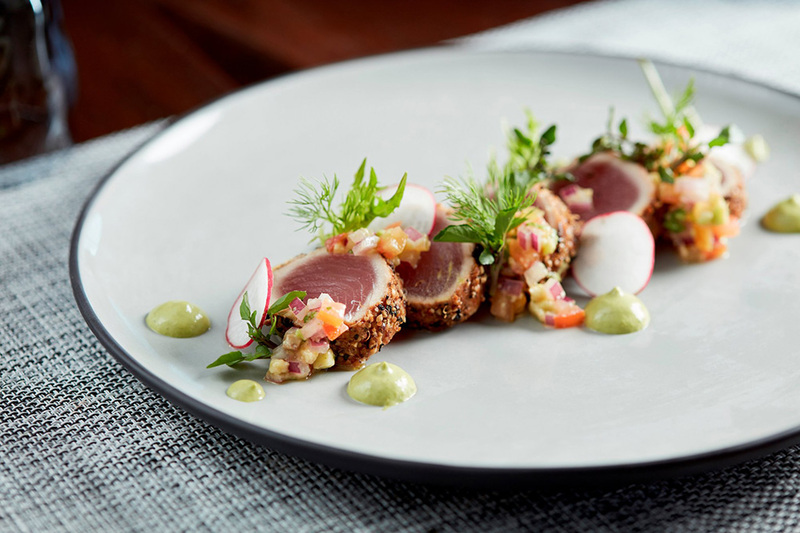 Guests are served the most tantalizing gourmet dishes at the Dining Pavilion. The authentic Sri Lankan factor, however, has not been done away with. The island’s spices and atypical modes of flavoring the food have been incorporated with much love and care. 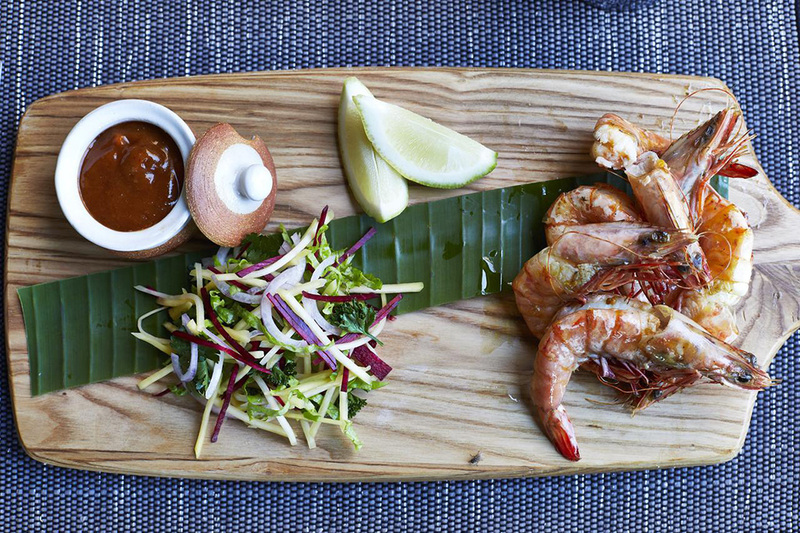 The menus are changed on a daily basis into even more creative alternatives, ensuring that you never have to repeat a meal and are able to take in all that Sri Lankan food has to offer. Moreover, the venues for serving the meals, whether it’s the beach or the lovely moonlit garden by the beach, completes the package altogether. 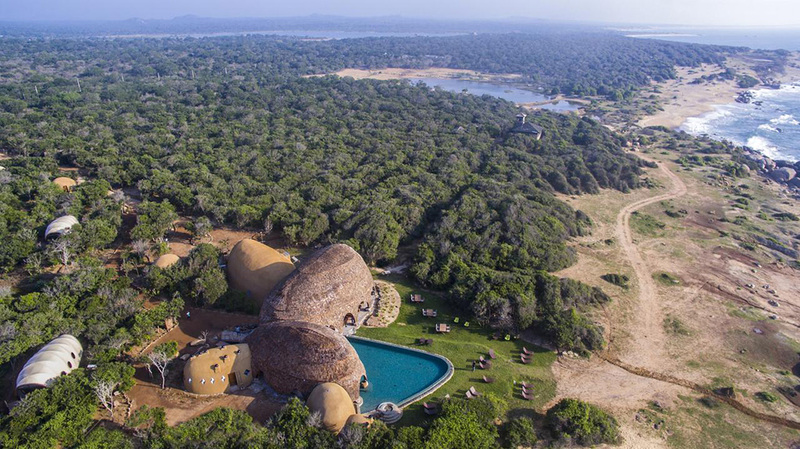 The Yala National Park is usually closed for renovation during the month of September. The resort will divert all game drives to other surrounding parks during this period. No more than 2 children can be accommodated on a sharing basis with parents in a Cocoon suite. An adjoining Urchin tent is recommended otherwise. Two of the Cocoon suites are available equipped with provisions for differently-abled guests. Owing to the high demand and limited availability of rooms, the hotel charges 30% of the payment while booking and the balance a month prior to arrival. Reserving four rooms or more requires a 50% non-refundable deposit while booking and the balance to be paid 90 days prior to arrival. The rates are fully inclusive and include one daily game drive, breakfast, lunch, afternoon tea, dinner, beverages, minibar charges, Wi-Fi, taxes and service tax. Pets are not allowed on hotel premises. Wild Coast Tented Lodge allows you to disconnect with the routine chaos of everyday urban life and instead live the way you were supposed to live- care-free and at one with nature. Give yourself a much-needed break and book a stay at this resort to get in touch with your inner self.